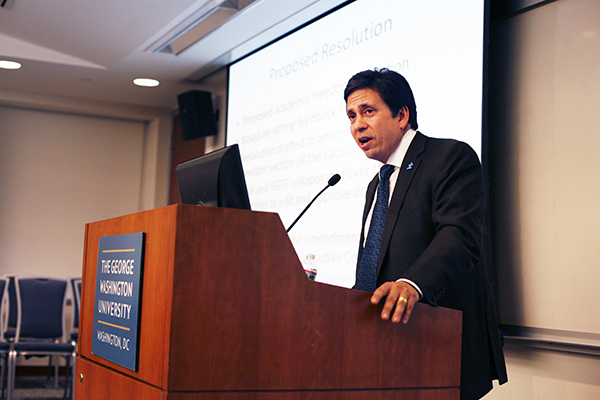 Board of Trustees chair Nelson Carbonell planned a nearly year-long review of the faculty code, a process that Carbonell now said could now extend past that deadline as he collects feedback from several hundred professors. A sweeping review of the faculty rules led by the head of the Board of Trustees will extend past its semester-end deadline, after proposed changes riled the Faculty Senate. Instead of bringing a handful of recommendations to the Faculty Senate floor on Friday, Board of Trustees Chair Nelson Carbonell announced that potential changes to the tenure approval process or makeup of the dean search committee will take months longer to hammer out. “In each of these areas, I would have to say with all humility, we were counseled early on that they were too complicated to get done in a year and those who counseled us that were correct,” Carbonell said. Those ideas will now move into several working groups, which will research changes this fall before producing resolutions. The delay, which will now incorporate more professors’ input, represents another win for a faculty body that already convinced top administrators this year to halt a potential plan to build a campus in China. Long-serving faculty have leveraged their influence against deans and other administrators in recent years, with some trying to hold a vote of no confidence against former law school dean Paul Schiff Berman and accusing Peg Barratt, former dean of the Columbian College of Arts and Sciences, of lacking a clear vision for the school. Emails from Kim Acquaviva, a former member of the Faculty Senate’s executive committee, to the University’s two highest ranking officials last summer alleged that deans did not have the power to stand up to tenured faculty determined to oust them. Carbonell argued last month that shared governance did not mean faculty have the final say against administrators. Kim Acquaviva, a former executive committee member, told top University leaders last year that she was concerned by the power of tenured faculty over deans. Debate about launching a University-wide tenure committee also resurfaced last month after Carbonell’s presentation. He argued such a move would streamline tenure policies, and hold faculty across schools to the same standards when applying for the lifetime employment role. The extended timeline will give faculty more time to weigh-in on the most drastic ideas, Carbonell said. In addition to the 600 faculty members who attended meetings with him during his listening tour over the past six months, about 500 faculty responded to a survey released two weeks ago. That survey will stay open for another week, in the hopes that more than more than two-thirds of GW’s total faculty respond. “It will give more people a chance to participate, which I think will be really helpful. I think some of these areas are complex,” Carbonell said. The first set of formalized recommendations on academic freedom will be presented to the Faculty Senate next month, and will aim to more clearly define what rights faculty have in the classroom and in their research, said Charles Garris, chair of the professional ethics and academic freedom committee. David McAleavey, an English professor and member of the executive committee, which will vote on the resolution this month before it goes to the full senate, said he hoped the resolution would not try to define academic freedom, but the survey distributed by Carbonell had asked faculty to give their interpretation of the term. “That made me a bit worried, because I don’t think academic freedom is something that the University itself should be in the business of interpreting. I think it’s a larger issue than a local interpretation,” he said. McAleavey said other topics may take even more than a year to finalize, although having more faculty input in crafting proposals would make professors more comfortable with the plan. The sudden urgency of reviewing the guidelines surprised faculty members when Carbonell announced his intentions last fall. The closely guarded code outlines everything from tenure approval processes to part-time faculty’s role in GW’s shared governance model. Paul Swiercz, a management professor on the Faculty Senate, said more conflict would likely arise later as some of the most contentious ideas are debated. “The work process has become much more clear as a consequence of today’s presentation. What remains less clear is how the consensus on the final document will be achieved,” he said. -Jacqueline Thomsen and Chloé Sorvino contributed reporting.